Thank You Somerset Home Magazine! I just returned from a long weekend away and had a surprise waiting for me in the mail...the latest copy of Somerset Home Magazine ...which included one of my projects! Do you remember when I made these pillows last spring? Well, shortly after I posted them on my blog, I heard from Beth Livesay, managing editor at Somerset Home magazine! To make a long story short, my pillows headed out to California and (pinch me...) I ended up writing an article for the Volume 7 edition which goes on sale August 1st! 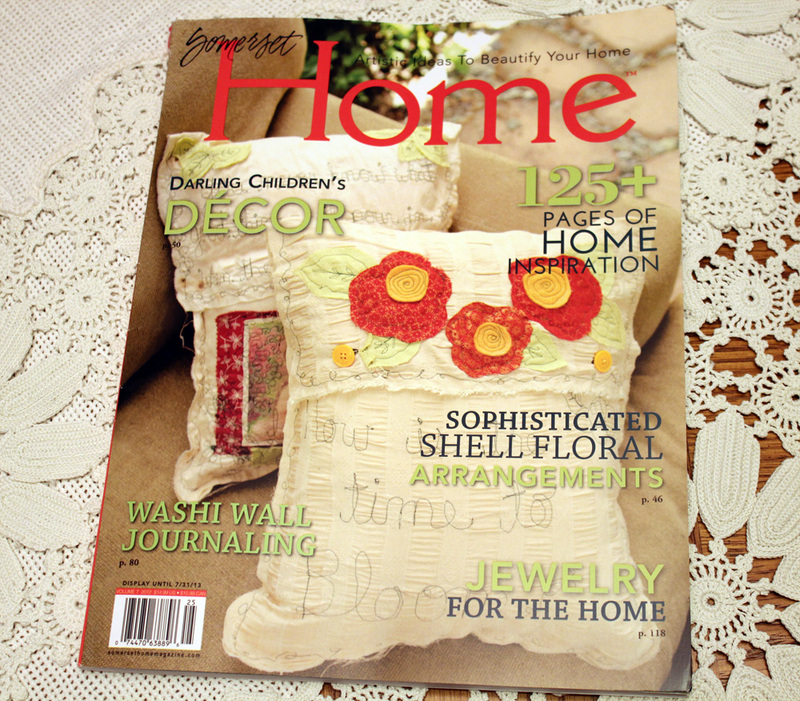 The magazine is loaded with beautiful ideas and projects for your home! Thank you so much to Beth Livesay for all her help and encouragement, and Somerset Home magazine for including my article! It has been a wonderful experience! Congratulations! Hasn't blogging lead to some exciting opportunities??!! So happy for you, Linda! That's so exciting and so deserving as the creative work you do and the effort you put into breathing new life into found objects is very inspiring. Congratulations and I'll be sure to look for your article and your pretty pillows. Wow! Congratulations!!!! I can't wait to go get it and read it. To think I can say, I KNOW her!!!! Congratulations Linda! That's exciting. I will have to check it out. Congrats, Linda! 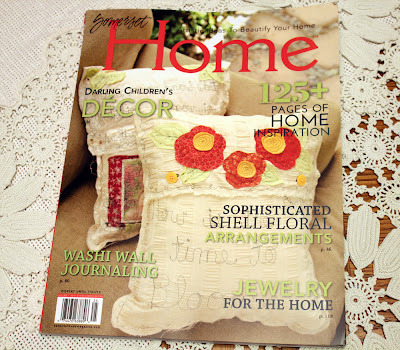 Your pillows are definitely magazine worthy! I've worked with Beth a few times and even met her in person. She has a very thoughtful and genuine way about her. With your creativity, I imagine you will be hearing from her again!! 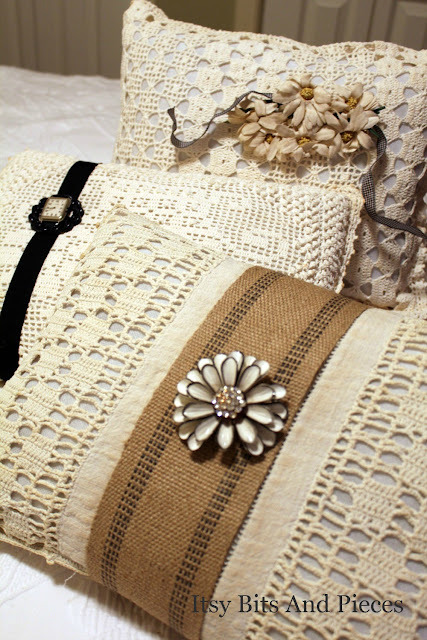 I loved these pillows when you first shared them and I can't wait to see them in the magazine!! Oh Linda! That is so wonderful...congratulations! I can't wait to see the article! So cool, LInda! Very excited for you! That is so cool! Congratulations! I'm so excited for you! Hello up there on Cloud #9, I am thrilled for you and the pillows are gorgeous. Oh Linda this is fabulous!! What an honor to be contacted from them. Yeah for you! Congratulations and these do look ever so lovely indeed. OMG!!! How exciting! Now I'll have to watch for the magazine at the book store. What a great publication to be part of. Congratulations!!! Yay Linda! Your Pillows are Amazing!! it looks gorgeous, a very beautiful feature. What a great thing in the mail,to return home to. Congratulations Linda; wonderful to see yourself in paper print in such a lovely magazine. You are so creative ! SUPER CONGRATS!!! I'm going to have to find a copy this weekend (oh, this means I will probably have to venture to the big city...i.e. Seattle...but it will be worth it to see this in person...) I'm sure you are thrilled! Congratulations! What an honor and well deserved. AWESOME!!! CONGRAT'S TOO!!! They are darling pillows! You are now Famous!!! When I get a copy of that magazine, I'll be needing your autograph! Thank You VERY MUCH for your prayers for my BFF!!! My blogging friends are amazing! I'm so excited for you Linda. They deserve the recognition. I love these pillows, they're gorgeous! Yay Linda, congratulations! I loved those pillows from the moment I first saw them and I will look for the magazine! Linda...Oh I am out of breath it was quite a trek to get to you up here on cloud 9......OH, I am crazy excited for you!! I love the pillows and forever and all time you will be a published artist...Congratulations!! Congratulations Linda! Those are some pretty pillows. Congratulations Linda.....what a wonderful honor & compliment to have your work in a national magazine! Published? Wow.... wow and well done!!!! Congratulations. 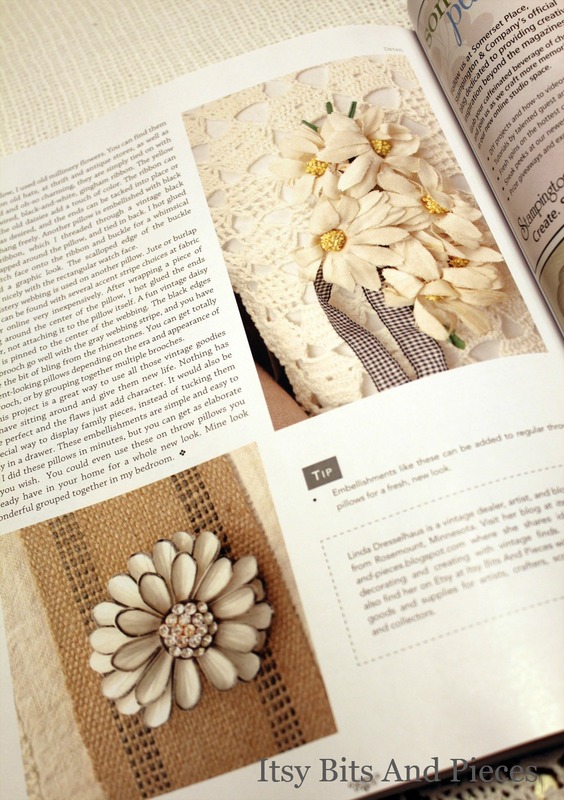 It's always fun to see our creations in a magazine. Can't wait to check out the magazine. Pillows are lovely. Congratulations! I am so proud for you! 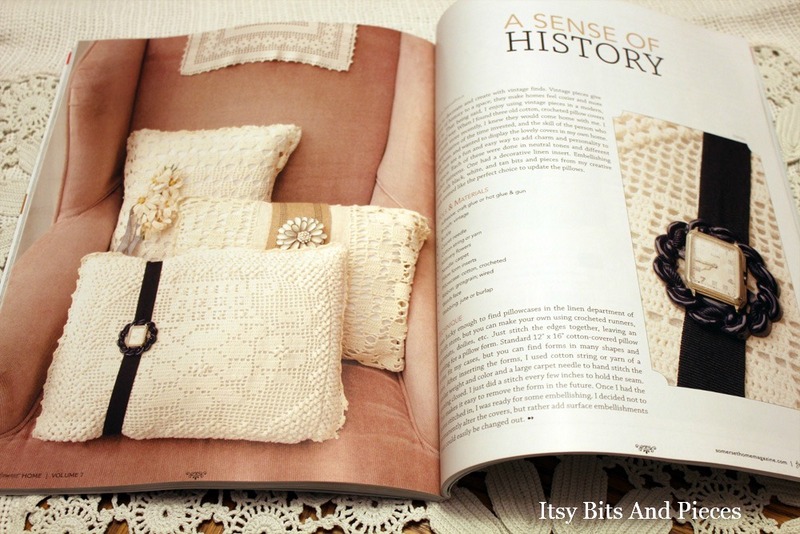 I do remember the pillows and am delighted the ended put in a magazine. Well deserved, Linda! OMG, congrats!! This is great news. I'll have to ck. it out! Have a great weekend. TGIF! I can't wait till vacation. I'm burnt out from work. Congrats, Linda! I bet your feet haven't touched the ground since! I remember when you posted those pillows, love them!!! See you soon... maybe at my sale if not JB ! Oh, Linda, that is incredible. I remember those gorgeous pillows. Congratulations. Congratulations! You totally deserve it! You are so talented and the pillows are amazing! This is so fantastic!!! Your pillows are wonderful and what a great thing to come home to: mail that says YOU are in a magazine!!!!!! Can't wait to see the edition. Congrats! It looks like a wonderful article! Nice job and congrats on the write-ups!